Meet Flo. She's a big sister who likes playing with paint and wearing sweaters that her mother knits. Flo also likes teasing her little brother, Wendell. They play hide-and-seek (though Flo might not actually seek too quickly). They play dress-up, too (even if Wendell always gets the bad costumes). Their parents wish they would get along, and they do try. Sometimes. Maybe they could put up a lemonade stand? 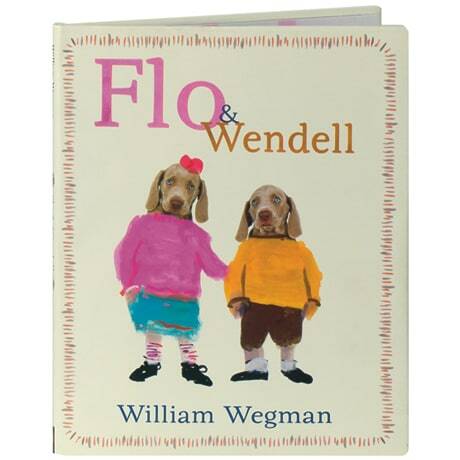 Any book from artist, photographer, and filmmaker William Wegman is cause for celebration, but doubly so when it stars his adorable Weimaraner puppies (Those velvety ears! Those bright blue eyes! ), as in this book for readers up to 8 and dog lovers of all ages. Wegman's real-life pups Flo and Topper lend their comically stoic expressions to his painted cartoons of big sister Flo and little brother Wendell, whose occasional flashes of sibling rivalry are not enough to displace their shared sense of imagination, adventure, and camaraderie in a hilarious tale about what it takes to play nice.